Blondie and Brownie: So That's What Flagels Are For! 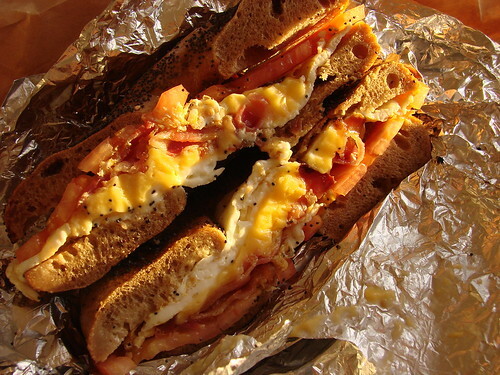 I generally don't go for bagel breakfast sandwiches because between the thickness of the bagel and all the filling, it's recipe for a jaw ache for me. Flagels give you the bagelike experience while making for a sandwich that you can still fit in your mouth. Win! 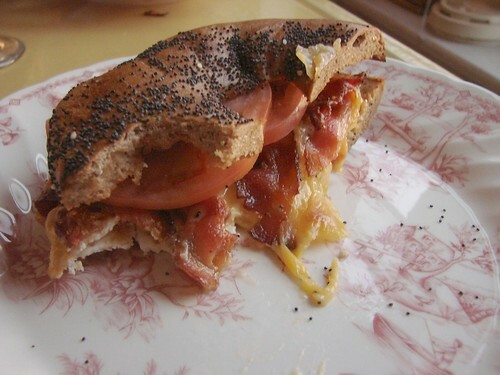 Take one toasted Terrace Bagels flagel, add egg whites, American cheese, crispy bacon(! ), and tomatoes. The tomatoes are key to the sandwich. Not that there's anything wrong with bacon, egg, and cheese, but the tomatoes give a what's admittedly a "farmer's breakfast" (or just a gut bomb) that little bit of lightness. I recommend going with an everything flagel if they have them--those toasty oniony bits take the sandwich right over the top. Delicious. I'm feeling the "flagel" as a good alternative to toast or English muffin for an egg/bacon sandwich.. I couldn't imagine getting that between an Essabagel -- wayyy too much filling.. now that hurts your mouth!